On to Lesson 6 in our Boot Camp! This lesson will cover all the basics on the Intersect feature. Silhouette Boot Camp is filled with mini lessons that help us learn the terminology used in the Silhouette Studio software so that we can cut any design we can dream up with ease! In lesson 5 we talked all about the divide tool in Silhouette Studio. We learned how we can turn two or more shapes into multiple shapes that all work together to create more complex designs by dividing them. You can catch up on the Silhouette Studio Divide feature here! There were 5 great examples on how to use the divide tool in your designs, so make sure you check it out! Sign up for my Silhouette Newsletter which will email you when the lessons are released each week. Click HERE to sign up! Pin this post! Each of these lessons takes me on average, 8-12 hours to create for you. I can do these lessons for FREE thanks to your support in coming to my site. By pinning this post or sharing it on Facebook with your Silhouette friends, it helps me spread the word so that I can keep the resources and freebies FREE to you! We are continuing our way through the Modify Panel today by learning about the Intersect function. The intersect function has a lot of similarities to the crop function, but works slightly differently. Read on to find out how and why! 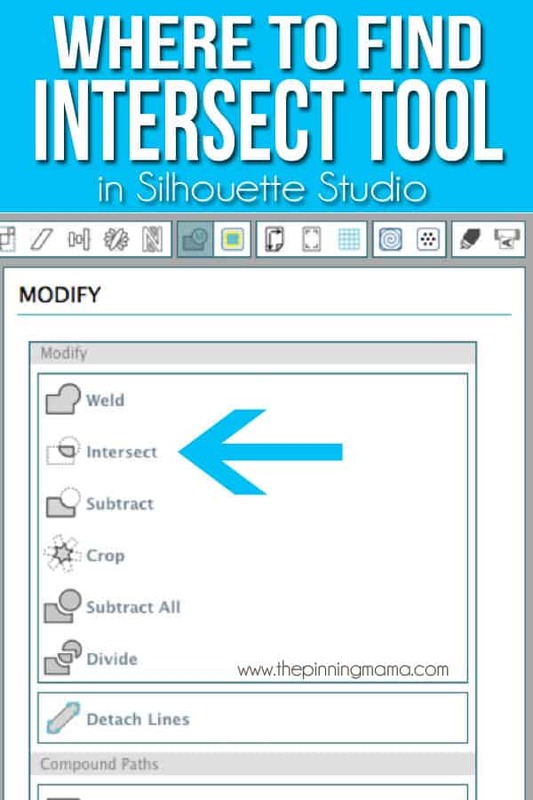 What Does Intersect Mean in Silhouette Studio? Today’s lesson is pretty short and sweet. As I mentioned above the intersect is similar to the crop function and generally the crop function (see lesson on Silhouette crop function here) will take care of 80% of situations when I am designing. We will go over the difference with Intersect, but since you already understand the Crop function, this lesson should be a breeze! This option will leave only the overlapping part, or intersecting part, of the selected images when applied. 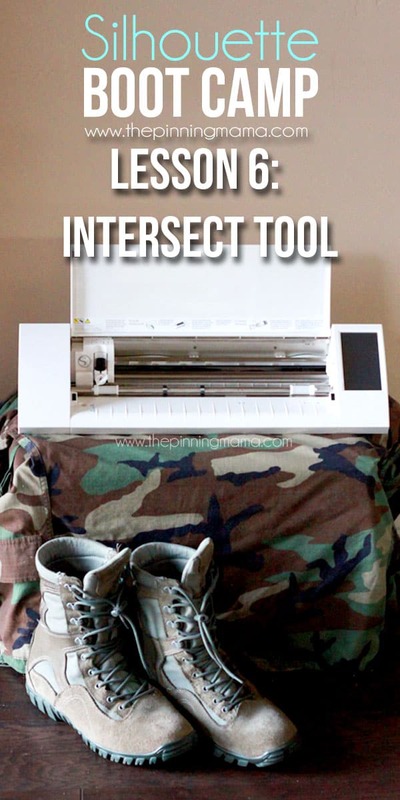 The intersect tool allows you to take two or more shapes stack them on top of one another. When you select “intersect” it leaves only the design that “intersected” each other. When you only use two shapes this will work the same as the crop function, but if you have more than two shapes overlapping you will see the difference between them easily. When at least 3 shapes are overlapping at least one point, there will be areas that all three overlap and areas that only two out of the three shapes overlap. In this instance, when you use the crop option, it will remove any area with NO overlapping shapes. Where as if you used Intersect, it would only leave the space where all three shapes are overlapping, deleting the part where only 2 shapes intersect that crop would leave. You can see an example of this in the picture below. 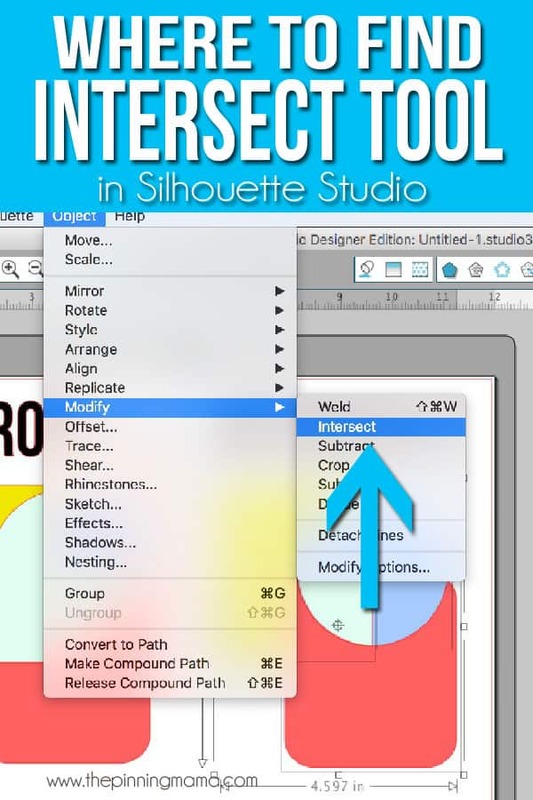 Where do I Find the Intersect Feature in Silhouette Studio? 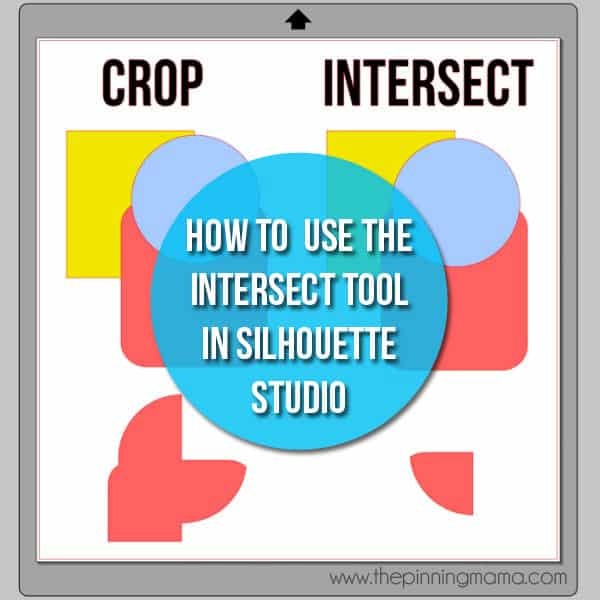 How do I Intersect Shapes in Silhouette Studio? Open up up two or more shapes. Move the shapes so that they overlap in one or more places. Open the Modify window in the top right tool bar and then click Intersect in the menu options. The intersect tool will be used similarly to how the crop tool is used to help to combine shapes to create a new design or create a separate piece that fits seamlessly into the design. Quick and easy, as promised! Now you are done with SIX whole lessons and well on your way to becoming a Silhouette pro! Next time in lesson 7 we will be talking all about the subtract function which is another super useful one, so make sure to check back soon! You can also find some of my favorite tips for newbies in this post about 13 Must Know Tips for Silhouette Beginners and in my Silhouette 101 series! And don’t forget to check out my FREE Silhouette Cut Files section! See you next time! Understand the concept but would you explain a design in which this would be useful.